BASS HUNTER MAKES 3 SIZES OF MINI BASS BOATS. DO NOT GET RIPPED OFF BY A LOW ADVERTISED PRICE AND NEVER GET DELIVERY OF YOUR MERCHANDISE AND THEN TO FIND OUT YOUR CREDIT CARD HAS BEEN CHARGED TO THE MAXIMUM. 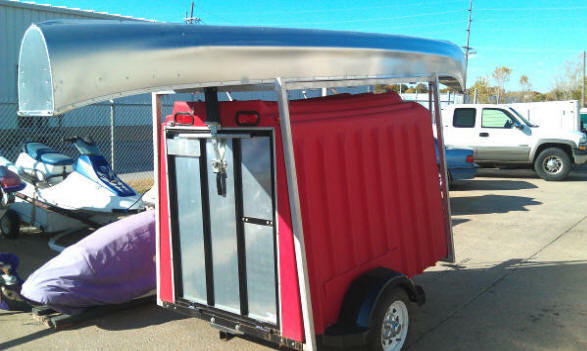 ALL OUR TRAILERS ARE AERODYNAMIC AND RIDE IN YOUR VEHICLES SLIPSTREAM. EFFECTS ON YOUR GAS MILEAGE IS VERY LITTLE. ALL OUR TRAILERS ARE AERODYNAMIC AND RIDE IN YOUR VEHICLES SLIPSTREAM. 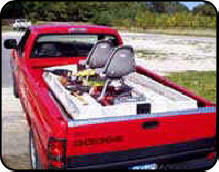 EFFECTS ON YOUR GAS MILEAGE IS VERY LITTLE. THIS IS OUR TESTIMONIAL TO THE QUALITY OF OSAGE CANOES. THE SALESMAN'S DEMO BOAT IN DENVER, COLORADO IS AS PICTURED. IT IS SQUARE STERN WITH TRANSOM TO SUPPORT A MOTOR. 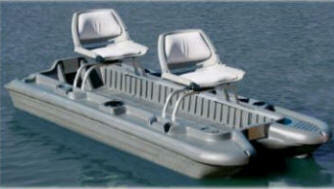 IT HAS BEEN USED AT BOAT SHOWS AND TO MAKE TV ADS. IT BEEN FISHING IN OVER 25 STATES AND PROVINCES AND HAS BEEN USED IN THE PACIFIC OCEAN. AS YOU SEE IT HAS THE SIDE STRETCHED FOR ADDITIONAL STABILITY. THIS FEATURE IS CALLED A SIDE SPOONSON. 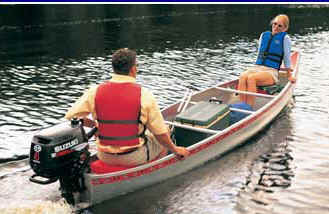 BELOW ARE OUR RENTAL CANOES SOLD WORLDWIDE. FROM MINNESOTA TO TEXAS AND MAINE TO CALIFORNIA YOU WILL FIND OUR CANOES. IN VALENTINE, NE. SOME OF OUR CANOES HAVE BEEN IN SERVICE 43 YEARS. Red, Blue, Green, and Yellow powder-coated canoe colors available with aluminum trim. LEFT PHOTO SHOS STANDARD FRONT TIE DOWN. 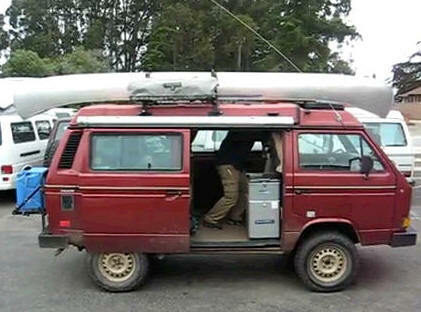 I CARRY MY CANOE ON MY YUPPIE WAGON TRAILER. I HAVE PLENTY OF SECURE ROOM INSIDE THE TRAILER FOR ALL MY CAMPING, AND FISHING, BACKPACKING EQUIPMENT. I AM READY TO GO AT A MOMENTS NOTICE. SEE MY FISH BELOW. I WANTED TO SEND YOU THESE PHOTOS AS I WANTED TO SHARE WITH YOUR WEBSITE VIEWERS ALL THE FUN I HAVE HAD OVER THE YEARS. I HAVE BEEN USING OSAGE CANOES SINCE 1970. THEY HAVE GIVEN ME SOME FANTASTIC FISHING AND HUNTING ADVENTURES ON THE WATER. I LIVE IN DENVER, CO. AND YOU CAN RENT THEM AT CHERRY CREEK RESERVOIR. 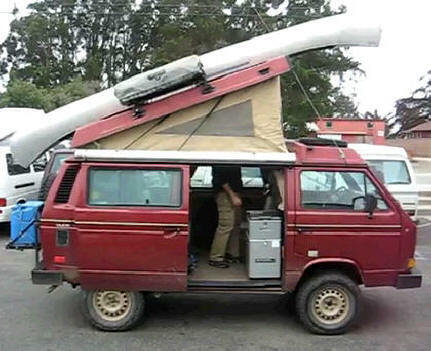 I TAKE MINE EVEN ON MY RAISED ROOF CAMPING VAN. CONTACT US FOR A DEALER NEAR YOU. OUR VERSA TRAILER CARRIES YOUR LOAD LEGALLY WITHIN THE 3 FT. TAILLIGHT TO END OF LOAD LAW.